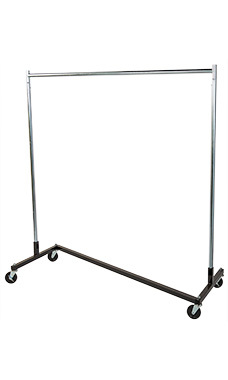 The Economy Single-Rail Z-Truck Rack is a 300 lb weight capacity workhorse great for storing clothing. This rack is perfect for sales, specials or sidewalk sales. The Economy Single-Rail Z-Truck Rack is 63"W x 24"D x 68"H with 4" locking industrial casters and brushed chrome uprights. No need to worry about storage space because Z-Trucks nest directly into one another to maximize space. Learn more about Z-Trucks in the Customer Connection section of our website!